A super boy fighting against ASD & T21: My independent boy! Promoting self-care skills it is important to foster independency in young children, which is I try to do with my son, specially, because he has always showed interest in do things on his own and it is also a natural way to strength his joins and eye-hand coordination due to he has hypotonia (low muscle tone). Tommy attempted to put his shoes on since last September. 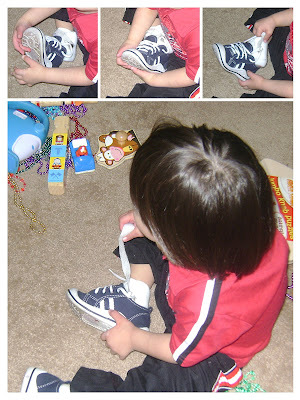 Many things have been going on that I haven't dedicated too much time to help him in learning how to put his shoes on. Once in a while, we have seen him putting daddy's shoes on or putting any object could fit on his feet. Yesterday morning, I got so excited because Tommy put one shoes on by himself for the first time. What excited moment! When I realized this I took the shoe off and I gave it to him again and he did it again, but this time I had my camera ready. We went out yesterday evening and before we left I gave him one shoes and he put it on again. So now is just matter on time that he can learn what shoes is for the right and left foot. I don't know what age is appropriate for young children to put their shoes on, what I know is Tommy achieved this milestone on his own. We are very proud of him! His diagnosis is not limiting him to achieve his full potential.